COMEDIAN Spike Milligan once referred to Woy Woy as the “world’s only above-ground cemetery”. 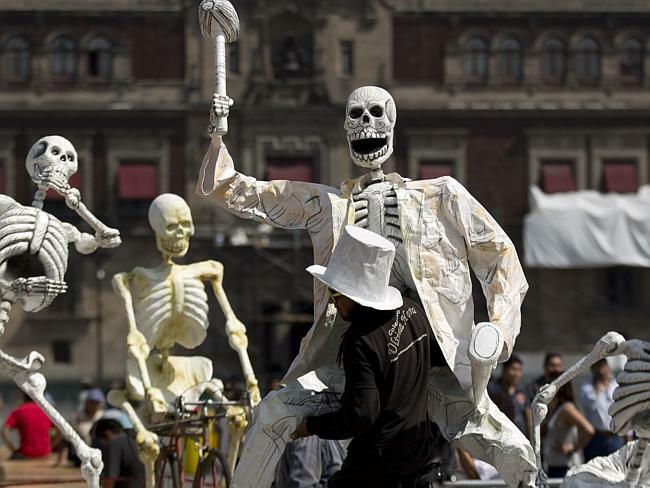 Now the peninsula suburb is living up to its reputation, with the coast’s first Day of The Dead festival. 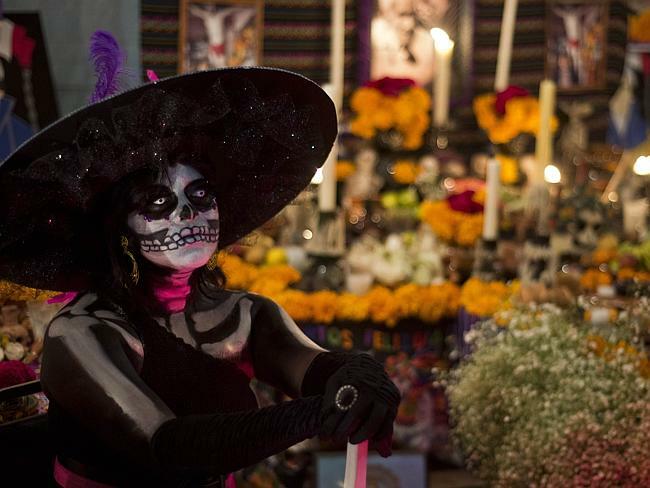 In a nod to the colourful Mexican Day of the Dead ­festival, in which people honour loved ones who have died, the peninsula is hosting its own celebration this Saturday. 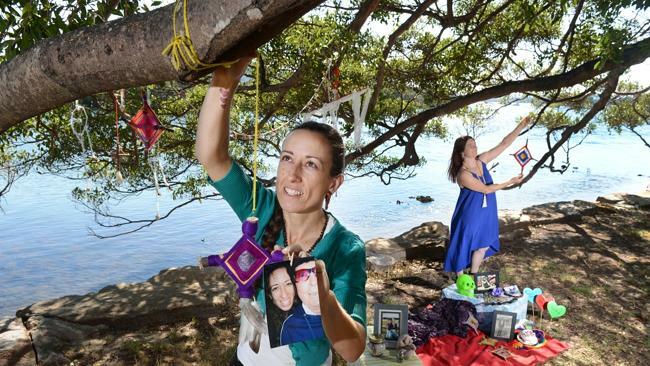 The inaugural community picnic is the brainchild of ­Ettalong Beach mother and end-of-life photographer Kim Ryder. She says her fascination with “society’s last taboo” was sparked after a near-death experience in 1997. “This changed my outlook on life forever and then my mum was diagnosed with terminal cancer and died in 2008,” Ms Ryder said. “This was my first first-hand experience with death and I started thinking about how we, as a society, don’t deal with death very well. “It just gets tucked away in hospital rooms and we don’t talk about it. She said the Day of the Dead community picnic is not about “being offensive or in anyone’s face”. “There might be some tears and that’s fine,” Ms Ryder said. “We’re taking a ‘soft’ approach to death and this is definitely a family-friendly event. There will also be guest speakers from other cultures, including Brazil and Argentina sharing their ­personal death experiences and customs. I am hoping by now that you have heard about our upcoming Day of the Dead Community Picnic on Saturday 2nd November 2013. In fact, I hope it’s in your diary (in pen!) by now and you’re planning with the family what and who to bring along! This picnic of remembrance will feature a handful of verbal short stories or ‘sharings’ from a few community members from other cultures, such as our local Aboriginal culture, Argentina, Brazil, and hopefully New Zealand! It’s the first event of it’s kind, so help us show Gosford City Council that we want to be part of social change regarding how we as a culture deal with, approach and view End of Life and After Death. Please invite your friends and family, colleagues and neighbours. Thanks to a new Death Cafe fan, Kirsten Colvin, Death Cafe Central Coast has gotten some new publicity of late. It’s always great to see the message and Death Cafe concept getting out there, reaching community members who may never have heard about Death Cafe before. I’ve been compiling a list of songs to play at my funeral. No, I haven’t had a near-death experience and I’m not terminally ill. In fact, I’m fine. I’ve just been coming to the realisation for awhile now that I am going to die. And so are you. Strangely, few friends or family will indulge me in discussing the subject. In my family, death is pushed to the edge of life and only reluctantly tolerated at funerals – uptight, depressing affairs where crying visibly (let alone volubly) threatens to splinter the fragile social veneer overlaying our collective fears. Fortunately, not everyone thinks like that. All over the globe, groups of like-minded, death-confronting people are meeting up at Death Cafes to eat cake, drink tea and talk about death. It’s not an underground movement; everyone’s welcome. According to theDeath Cafe website the objective of this “social franchise” is to “increase awareness of death with a view to helping people make the most of their (finite) lives”. The first Death Cafe in the UK was held in 2011 by founder Jon Underwood, who was inspired by the Cafés Mortels set up by Swiss sociologist Bernard Crettaz. So far there’ve been at least 200 events, most in the US and Britain, as well as Canada, Italy and Australia. Some take place in actual cafes; others in spaces hired for the event. There are guidelines for facilitators to follow, one being that refreshments, ideally tea and cake, are made available at every event. Despite my aversion to mixing death and food (it seems I’m not the only one who sees it as taboo), I head to my first Death Cafe one Tuesday night, armed with an open mind and a box of tissues. Does that make me a newbie deathie, I wonder? Should I try and be blasé or will the film,Cherry Blossoms, turn me into a blubbering mess? (Directed by Doris Dörrie, the story takes place in Germany, then Tokyo during hanami, the fleeting cherry-blossom season. We meet a couple, a stifled and self-sacrificing wife and her dour, oblivious husband, as they grapple with getting older and the disrespect of their adult children. The unexpected death of one spouse leads the other to Japan and, ultimately, redemption.) Fortunately, it’s more uplifting than depressing and there’s no need for the tissues. About halfway through, my cushion proves inadequate for my nearly middle-aged bones and a kind soul offers to share her beanbag. Bless. Brownies are handed out towards the end, but I can’t bring myself to eat one until the main character has met his untimely but picturesque end beneath Mount Fuji. With cuppa in hand, we share our first names, but not our reasons for attending and start the discussion proper. The film’s brought up plenty of issues that mirror our own fears. Will we die with our dreams unfulfilled? Can we fulfil the wishes of the dead? Which partner will die first? How will the other one cope? Will we rely on the kindness of strangers, rather than family, to comfort us at the end? There are a few over-50s in the room and talk turns to caring for aged parents. One selfless soul visits her dying mother-in-law every day to give her, and now other residents in the dementia ward, love and attention. 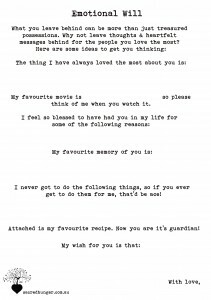 I hope there’s someone like her around when I get old. Others talk of the lack of community these days, a disconnection between generations, and rifts with children they worry will never heal. The under-30s are more upbeat. One adores her family; they’ve all moved to the same street to be near each other. Another tells of her Gran who loves her aged-care facility and bails on family occasions to get back there as soon as she can. It’s an intergenerational snapshot of the lead-up to death as well as the main event. Fascinating stuff. The discussion goes up a notch when we talk about cross-cultural ways to mourn, including a confronting scene in the film that shows a skeleton post-cremation and an elaborate Japanese ritual where family members pick up the larger bones with chopsticks and carry them to an urn. Could we hold that kind of ceremony in Australia, we collectively ask? “No,” pipes up my beanbag pal, who reveals she’s a funeral director. I wonder why she’s there but it seems rude to ask. The questions start flying and the bigger issues make way for the nitty gritty. “I thought all the bones turn to ash?” “No, they grind them,” she says. Wow. “Can you go and watch that?” asks one of the facilitators. “No. Sometimes you can watch the insertion of the coffin.” Why would you want to, I think? But some do. Suddenly the discussion, which I find both horrifying and fascinating, is over. It’s time to vacate the hired studio, but people linger to chat and help pack up; there’s a real sense of connection among this small group of strangers. Still, there’s no shortage of people wanting to talk about death. Past attendees have included everyone from psychics to palliative-care nurses, art therapists and psychotherapists, people who have had near-death experiences and, of course, those who have lost someone close. “It’s different every time,” says Kim. She seems amused but interested that I found the discussion challenging. There’s little about death that fazes her. As well as facilitating Death Cafes, she also owns an end-of-life and after-death support and education service that runs death-focused workshops and community events. She’ll even paint you a coffin to match your personality. “I live and breathe this stuff,” she says. Hopefully after a few more events I’ll have a little more of her courage, although I’m not keen on the upcoming behind-the scenes tour of my local crematorium with picnic to follow. In the meantime, I’ll keep making the most of my finite life. I don’t want regrets. I don’t want “I should-haves”. I want to live each day as if it were my last. So I’ll keep adding to my “Funeral songs of all time” playlist and sharing it with my friends. There’ll be no Wind Beneath My Wings at my funeral, but I’m hoping my family will crack a smile at Don’t Worry, Be Happy or at least have a good, loud cry. Or course, I’m in no hurry to test my theory (not that I’d be alive to see it) and hoping like hell that writing this has not tempted Fate. Thanks Kirsten. We hope to see you at the next Death Cafe on 17th November! So I am pleased to say that that all-consuming terror that I had been feeling is the exception rather than the rule these days…despite the fact that the diagnosis has turned out a little worse than we expected. I definitely have sad times, but that deep, dark, terrifying place I was at doesn’t happen too often. I think I have accepted that she has cancer, and am currently just focusing on her treatment options. The weekend was pretty tough. On Friday night she had about 4-6 beers with her best friend Wai, and Jay, and didn’t eat despite our encouragement to do so. She ended up throwing up at 2.30am and really suffered for the remainder of the weekend. On Saturday night she was crying in pain (across her back and where the para-aortic tumour is) and I just couldn’t bear it. I ended up crying with her. When I woke up at 6.30am the first thing I did was go to her room to see how she slept and to see if she was in pain, and she slept poorly and was in pain, and I just cried. In the end, when Jay got out of bed to get ready for work, I jumped in and snuggled up with Mum for an hour or so. It was so yummy!! On Sunday we convinced her to try taking the oxycodon that had seriously made her throw up, and although she felt a bit nauseous and “heady”, it stopped the pain which was good. The more she took/takes it, I think the less nausea she felt. She also started taking my Fiorinal that I take for my neck, and has had two really good night’s sleep. When I hear that I smile. She’s also eating better…not having the heart-burn so much etc. I still think and talk about it all quite a lot…but then sometimes also get sick of talking about it. When I do cry, it tends to be a brief outburst, followed by calm….so I guess you could say I am not in shock anymore. I guess we should enjoy this time before the chemo starts in some ways? As it will bring with it some challenges as well as some success with controlling the tumours. We went to the oncologist last Thursday only to find out that the PET scan results were worse than expected and that there was “multiple boney tumours”. Also that the primary cancer had not been identified and that more tests were required. Whilst we understood the need to identify the primary, another week of waiting was not ideal. But here we are, close to the next appointment where I am sure he will tell us the primary has been located. This will bring the best possible outcome as they can treat it very specifically and appropriately, which will achieve the best outcome. I am sitting here in the quiet of my place for the first time in ages. It’s actually nice to be “home” and not to be living out of bags and between my place, Brad’s and Mum’s. I must make a point of being here more, and getting time on my own more. It’s actually nice to have some “me” time. I probably should be in bed!!!! It’s been ages since I wrote in here, and that’s not at all how I hoped it would be. When I started this I thought it would be a space to record every up-and-down of this journey, but there have been so many up’s and down’s and lefts and rights that I don’t think there’s been time TO write in here. My goodness – this is only the second time in more than 3-4 weeks that there has been the time and space (and inclination) to put pen to paper. Mum’s in bed asleep I hope, though when I saw her to say goodnight half hour ago she was feeling very uncomfortable – it kinda seems like it’s the constipation from the morphine, but my gut feeling tells me it’s actually the fact that there is a tumour inside of her, just under her diaphram, that is taking up space where there is no room. She says “I feel like there’s a big lump stuck just there” (pointing to where the para-aorta tumour is) and that’s because there is. I know it’s an awful thing to wonder, but I wonder how you die of her condition? Will it just grow so big and push on her lungs/heart? Does it produce gases or something that cause undesirable reactions? I don’t know what sort of a journey lies ahead. “Firstly I’d like to thank you all for coming today. As I am sure most of you would know by now, Mum and I had an amazing trip to Nepal in March and April this year….in fact she had her 64th birthday there. She was not feeling well both before and during the trip, but we were unaware of her illness at that time. Some days she was as pale as a ghost and in a lot of pain, but still she was determined to go on that elephant safari through the jungle in search of wild white rhino, which we did in fact see, and to endure bumpy journeys by horse and cart, just for “the experience”. Sometimes I am awe struck by the timing and content of that trip. I don’t even remember why or how we decided to go – we just did. It could easily have turned into a trip involving others, like Jenny and Brad, but for some reason we were both determined to make it our special little adventure, just the two of us. It was truly magical, and even though some days I rated her only a 7 out of 10 as a travel companion, which initial disappointed her but became an ongoing joke, it was an absolute privilege to have had her by my side. In true Carole form, we shopped till we dropped, refused to purchased over priced samosas, made numerous friends along the way, and even stayed at a Buddhist monastry and meditation centre where she opened herself up to the experience in a way I had not expected her to. There is no doubting that the journey we have all walked with mum since her diagnosis upon our return from Nepal has been a challenging one….filled with heartache and pain on a variety of levels. It would be easy to feel that her illness prematurely robbed us of this amazing, loving, vibrant, unpredictable and caring woman, and that’s why I would like to spend some time talking about the gifts I feel have been granted us while on this difficult road. Up until Mum became ill, even though she obviously loved me to bits, and I her, I think I subconsciously kept her at arms distance because she had a tendency to get very involved in my life, ever fearful that I would get hurt, and forever trying to shield me from making mistakes that may have brought me pain or sorrow. Through her brave and courageous journey with Cancer, however, she softened in a way I had not experienced her before, and this allowed me to fully realise, acknowledge, experience and express the depth of my love for her on a daily basis – and that love runs deep. She retained her determination, strength and stubbornness, but she also learnt to forgive more deeply…..For the first time in forever she allowed me and others to care for her….to give her gifts without saying “you shouldn’t have wasted your money”….and we had thousands of magical, loving, tender amazing moments that I believe would not have been possible without cancer. Without her illness I’d not have lived with her for 6 months….I’d not have had 3 months off work to spend with her…..I’d not have had the opportunity to change my purpose from caring for other families, to making my mother smile…whether that be by telling her a million times in one day that I love her, or by playing the fool. To be quite honest, without her illness, she or I may well have passed on never having fully shared and experienced our immense, sometimes overwhelming, and absolutely magical connection and love for one another, and that would have been a great tragedy. The nurses at the hospital said that to have held on for so long, she must have had a big, strong heart – but we already knew that! We joked though, saying that she was just giving heaven a chance to prepare for her arrival – lets face it, she could corrupt even the most angelic of angels, and Heaven just won’t know what hit it!! I don’t know if they sell camper-vans in heaven, but if they do, I can assure you she’ll still be getting the best price and probably would have doubled her money twice over by now!!! I know that we will all miss her presence in our worlds, and life will never be the same again, because she touched us all so deeply on so many levels, but I urge you not to grieve too long, but instead commit to living life with gusto, in her honour. I can hear her now saying “life’s too short”….and she is right. When we phoned people to tell them that our beautiful Mamma had passed away, there were many hearts broken, and many more tears shed. When we told people that the service was to be here at home, this news seemed to come as a bit of a shock to some of you, however, Mum’s last words to me were “I want to go home bub”, which I now know was her last request of Lee and Jenny also. Upon her “living list”, which Lee and I helped her write some months ago now, also appeared “have a party upstairs”, so please lets all join together today to not only share our grief and love, but to truly celebrate the adventurous and often outrageous and unpredictable life of my beautiful Mamma. Tomorrow, August 8th, is Dying To Know Day. 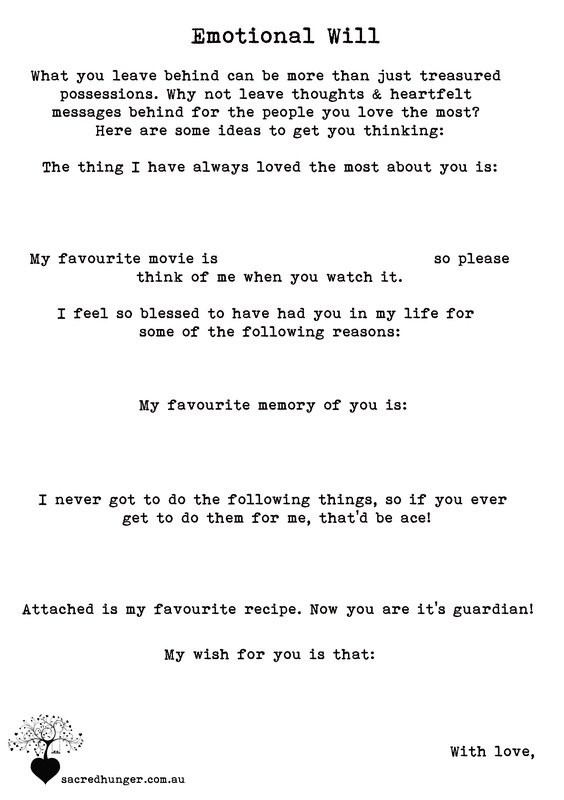 In honour of this awesome new day, that will soon become a fixture on the annual calendar of many people interested in talking more about death and dying, I have designed an Emotional Will form…something to get you thinking about what you might say in an Emotional Will. It was inspired by the Emotional Will found at the back of the Dying To Know book produced by Igniting Change. Feel free to use it as it is…..use it as a starting point…a talking piece…..or edit it and make it your own. It is my wish that it facilitates valuable and much needed discussions about death and dying.